Trying to setup docker from brew, however the engine does not seem to be included in any of the any of the official formulas. So these only installs the clients? Is there no keg with the engine/daemon? This will install the Docker engine, which will require Docker-Machine (+ VirtualBox) to run on the Mac. The following steps work fine on macOS Sierra 10.12.4. Note that after brew installs Docker, the docker command (symbolic link) is not available at /usr/local/bin. Running the Docker app for the first time creates this symbolic link. See the detailed steps below. Press Command + Space to bring up Spotlight Search and enter Docker to launch Docker. In the Docker needs privileged access dialog box, click OK. When Docker is launched in this manner, a Docker whale icon appears in the status menu. As soon as the whale icon appears, the symbolic links for docker, docker-compose, docker-credential-osxkeychain and docker-machine are created in /usr/local/bin. 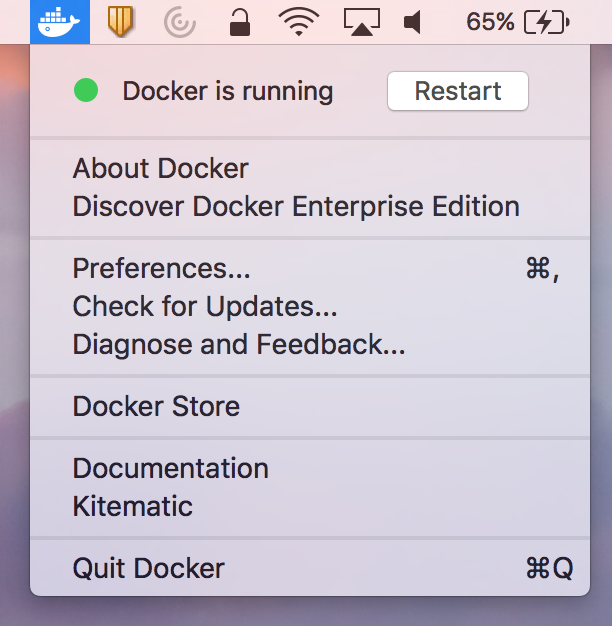 Click on the docker whale icon in the status menu and wait for it to show Docker is running. Test that docker works fine. If you are going to use docker-machine to create virtual machines, install VirtualBox. Note that if VirtualBox is not installed, then docker-machine fails with the following error. Not the answer you're looking for? Browse other questions tagged macos docker homebrew or ask your own question.